By the late �60s, radio-delivered psychedelia had saturated even the heartland. A Lovely Sight, Pisces� only attempt at an LP, never made wax; but the fuzz guitar phrases and tambourine shuffle of “Dear One” instantly illustrate the band�s woozy realm. Deeper inside, bass scales borrowed from Sgt. Pepper give way to Who moves wrecked by bad fidelity and harsh intrusions of found audio. Jefferson Airplane�s swirled, lysergic Haight Street utopia melds with the urban narcosis of the Velvet Underground�s East Village. But Pisces hailed from another ghost town altogether: Rockford, Illinois, where rusted, endless plains bear close resemblance to a bummer acid trip or a junkie�s rock bottom. In 1969, the industrial Midwest was hurting for the hard stuff, but what it got was plenty of the White Album—enough to have Jim Krein, Paul DiVenti, and Linda Bruner recording through a glass onion all their own. 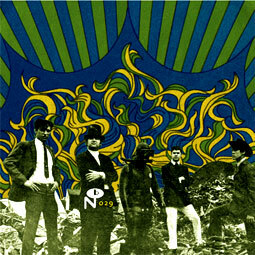 The unsettling balance of their unissued LP combines homespun psychedelic vision and secondhand studio trickery with naive readings of the rock sound of the day, resulting in a diverse, haunted rock headspace few coastal bands ever flew through, let alone over.